Ood Pants, Take 1 | Barbie Who? ← Who Will Join the Oodkind? In an ongoing attempt to preserve my sanity, I decided to take a break from the Ood mask. I finally finished the main body of it, but I need some time to decompress before I embroider and crochet features onto it. 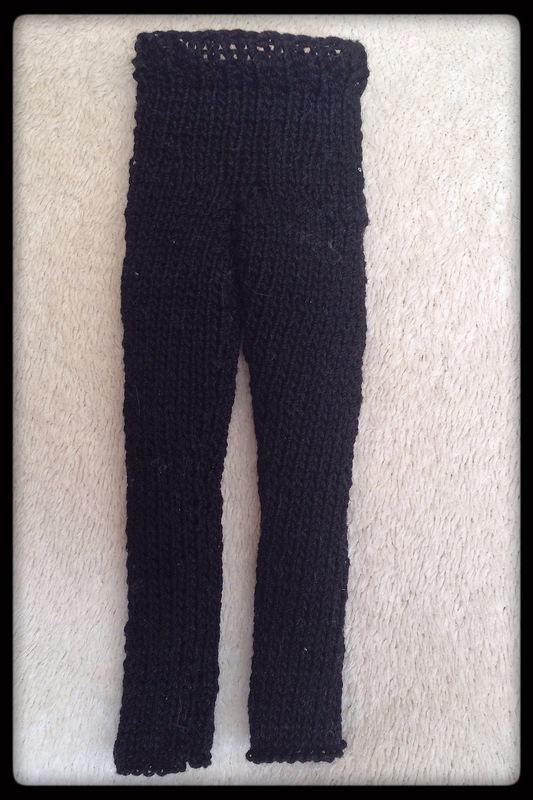 To fill that time, I have been working on a pair of pants for the Ood to wear. It was a fairly simple knit; it only took a few days to complete. For this project, I used pattern 967 from the Sticka till Barbie website. I liked this pattern because it looked great on the dolls in their pictures and matched the aesthetic I was going for. I used my new set of 2.00 mm double pointed knitting needles and black size 10 crochet thread to create them. The weird thing about using the tiny new set of needles is that I felt like I would bend them in my hands. They’re just so dainty! They’re made of aluminum, so the chances of me bending them were nil. Still, it seemed like more of a concern with this pair of needles than with the slightly larger plastic 2.25 mm needles I had used to make a pair of pants for Ken. I also believe the stitches are noticeably tighter and just look better than the previous pair of pants I made. It simply amazes me how much the size of needles can affect a finished piece, even when that difference is a fraction of a millimeter. Overall, using the DPNs was very easy for this project. In fact, it had an advantage over regular needles. When I had to knit the second leg, I kept the first leg on one needle and picked a new needle out of the package to knit the second one. I didn’t have to slide it onto a holder! This saved me a fair amount of time and frustration. With these needles, I rarely had a problem with stitches falling off of either end. I really like these new needles and plan on using them for more projects moving forward. Even with awesome needles, the actual knitting part was frustrating at times simply because of how tiny everything is. Doing a pearl increase with the dainty needles is the very definition of frustrating. It happened four times, and each time was incredibly hard to get right. I had a minor problem at the beginning of the first leg when I twisted a stitch at the end of a row; luckily it wasn’t noticeable after the piece was sewn together. I also ran into bigger problems towards the end. I forgot to properly secure the final stitch when I first cast off, so while handling the piece I unraveled half of the cast-off row. It was a pain to fix and took over half an hour because I had a terrible time seeing which way I needed to knit/pearl each stitch. Not all of the stitches were straight on the hook, so I had to make sure that I was picking up the correct side of each loop or it would have made the top row look wonky. This was tedious and time consuming. After doing that, I thought it couldn’t get any worse. Oh, how very wrong I was…. Once I finished casting off, I sewed the pants together with a tapestry needle. When I was finished sewing, I realized that I had made a terrible, horrible, no-good, very bad mistake. My cast-off row way too tight. It was so tight that it barely had any stretch to it. I couldn’t easily fix this because I used the loose end to sew from the back of the pants and down one leg – it would take hours to work the end back to the top without ruining the piece. I briefly considered cutting a stitch on the top row and just rejoining a new piece of thread for a looser row, but this seemed dicy. What if I dropped a stitch? What if I cut into the row below? With the sewing already finished, I couldn’t risk ruining the entire piece. I felt like a total novice for not noticing it. I know better than to cast off so tightly, but I think that I was so frustrated from the previous mishap that I let the cast-off get away from me. I tried to stretch the pants, but it was futile. The thread would break before it fit over the hips of either Ood doll. For a moment, it felt like I had put in all that effort for nothing. Then I remembered that not every doll has hips like the belly-button type of Barbie. I looked through my dolls, and I was encouraged to find a few that these pants do fit. They fit the Disney Rapunzel and Merida dolls that I have. Both dolls have a smaller body, smaller thighs, and smaller hips than the Barbie dolls. The tight cast-off barely fits over Merida’s thighs, but it is a good fit on her waist once the pants are on her. Rapunzel is slimmer all around, and this causes the pants to try and slip off. I think that they are a better fit for Merida, overall. Besides the fact that they don’t fit the Ood dolls, I’m not sure that I like these pants for an Ood. They are right against the skin of the Disney dolls, and I’m sure that they would be snug on the larger Barbie dolls. The pants from the Ood pictures I am basing the dolls on depict a roomier leg, so I may have to make my own pattern. 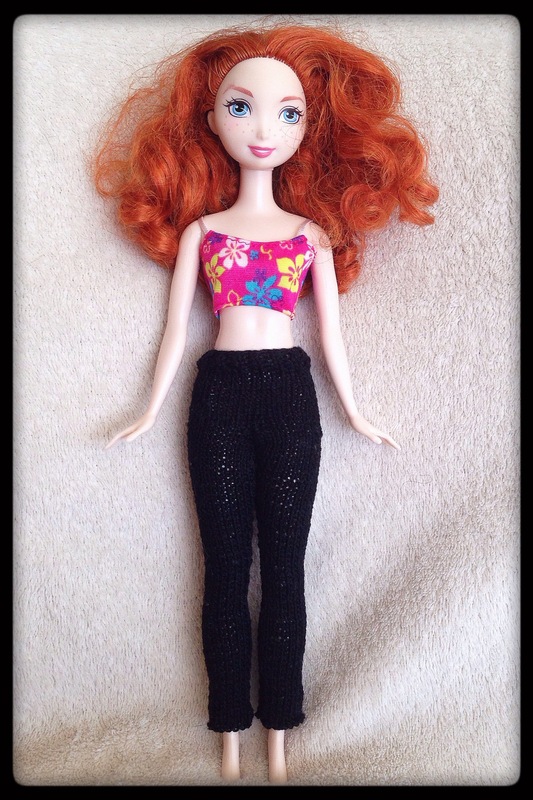 I looked through some of the patterns on the Sticka till Barbie website and they all seemed to be the similar to this pattern of pants with only slight variations – often just the color. I think I will make my own pattern for these pants and post it here on the blog. It will be fun to do a knitting pattern for once! That is the one silver lining from this hot mess of an experience. That is it. I spent a ridiculous number of hours making a pair of pants that don’t even fit the doll I intended them for. Just my luck! Even with the problems I encountered, I feel good about where I’m taking the Ood. Considering the style, I probably would have made a new pair of pants if they had fit, so it isn’t that big of a loss. Plus, I have a cool new pair of pants for the princess dolls to wear as they blaze new trails. It could have been worse. My next update will be about the Ood mask. I will buckle down and finish the first one over the next few days, and I look forward to sharing the journey. At least the pants didn’t get wasted. I guess that’s one good thing about the varying sizes of Barbie and other fashion doll bodies. A friend of mine sent me some bamboo 2mm needles and they felt so fragile in my hands I expected to break them. I bought a metal pair later and feel more comfortable with those but it’s good to have two sets in that size. Oh wow! I had no idea that they made bamboo needles that small. I can completely understand how they would feel fragile in your hands. That had to be frustrating for them to wind up the wrong size. I don’t knit so I have no idea how feasible it is to try on as you go. I only crochet and that is what I do to make sure everything is fitting, but then so far I haven’t used any patterns for anything either. It really was. It is easier to try on as you go with crochet because, generally, you don’t have to sew as much once you’re done crocheting. The pants had to be sewn up both legs and in the back, so it is hard to know how it will fit until you’re completely done. With crochet, most patterns have their ‘final form’ as you go, so trying it on is so much easier. Next time, I am going to check the waists before I see them, so hopefully I won’t run into this problem again with knit pants. That makes sense now. My mother only crocheted so I never learned to knit and really know nothing about how it works. Pingback: Straight-Leg Pants Pattern | Barbie Who?